What is a Natural Logarithm? 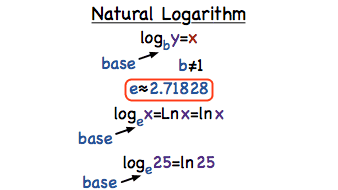 A natural logarithm is a logarithm that has a special base. In this tutorial, you'll be introduced to natural logarithms! In math, 'e' isn't just a letter, it's an irrational number! This tutorial shows you how mathematicians use the letter 'e' to represent a specific value and how having a base of 'e' is called a natural base. How Do You Convert From Exponential Form to Natural Logarithmic Form? Converting from exponential form to natural logarithmic form is easier than you might think! Follow along with this tutorial to see how to perform this conversion.